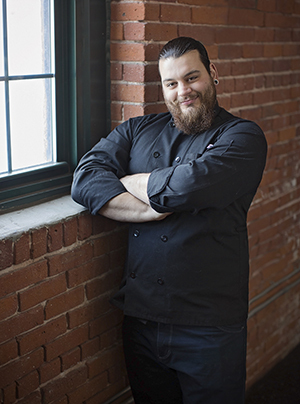 Executive Chef Tim Russo was born and raised in Worcester, MA where he attended Worcester Vocational High School as a culinary arts student. He participated in numerous cooking competitions placing first in the skills USA V.I.C.A. state championship and represented Massachusetts in the national competition. He received his Associates of Science in Culinary Arts from Johnson and Wales University. His work experience includes a variety of restaurants in the Worcester area, most recent Volturno and The Armsby Abbey. He has also worked at several restaurants in Providence, RI and Nantucket Island. As a Chef, Tim’s goal expose his customers to exciting ingredients and unique cooking techniques discovered throughout his career. This has been a deep-rooted passion since an early age. Tim was a very adventurous eater and always tried to encourage others to do the same. Through this exposure, he hopes to elevate the expectation for quality dining in the Worcester area. Tim feels his biggest accomplishment and proudest moment was when he competed in the Worcester’s Best Chef Competition where he won 1st place Judge’s Choice, 2nd place People’s Choice, and was named Worcester’s overall Best Chef 2015!